Say once a day for 9 days. Especially on the Feast of St. Dominic. O renowned champion of the faith of Christ, most holy saint Dominic, who didst renounce the honour and dignity of an earthly principality to embrace the poor, laborious, and mortified life which should distinguish a disciple of Him Who has said: "If any man will come after Me, let him take up his cross and follow Me." O burning torch, who being thyself consumed with the fire of divine love, didst incessantly labour to enkindle that sacred flame in the hearts of others, look down upon me from that throne of glory where thou enjoyest the reward of all thy labours, and obtain that some sparks of that blessed fire may be lighted in my soul, to animate and encourage me under any crosses or trials with which it shall please the divine goodness to visit me. Thou, O great Saint, regardest as nothing all the afflictions thou didst endure, and all the toils thou didst undergo for the promotion of God's holy cause; obtain, I beseech Thee, that the same ardent love which strengthened thee, may make sweet to me labours, humiliations, disgraces, or whatever other mortifications I may have to suffer for the Name of Jesus. May I ever bear in mind that nothing can happen to me but by the particular dispensation of a God Who is infinitely wise, and therefore knows what is best for my welfare; infinitely powerful, and consequently able to effect it; and above all, infinitely merciful and loving, Who has laid down His life for my redemption, and continues daily to give new proofs of His love and bounty. O tender Father of the poor who, when all other resources were exhausted, didst offer thyself for their relief, obtain for me that true spirit of compassion for the suffering members of Jesus Christ, which shone forth so conspicuously in thy holy life. May I, by charity to those whom Jesus so dearly loves, lay up for myself treasures in heaven, where thou now enjoyest that which the eye hath not seen, nor the ear heard, nor the heart of man conceived, but which God has prepared for those who love Him, and who prove themselves His Disciples by the observance of His Divine precept "love one another." I praise and thank God for the high degree of sanctity to which He had raised thee, and the special privileges by which He has distinguished thee. I conjure thee, by that gratitude with which thou shalt for all eternity be penetrated for thy Divine Benefactor, implore for me the grace to root out of my heart whatever is not agreeable in His sight, especially that evil habit by which I most frequently offend Him. Obtain likewise the favours I request in this Novena, through thy powerful intercession. 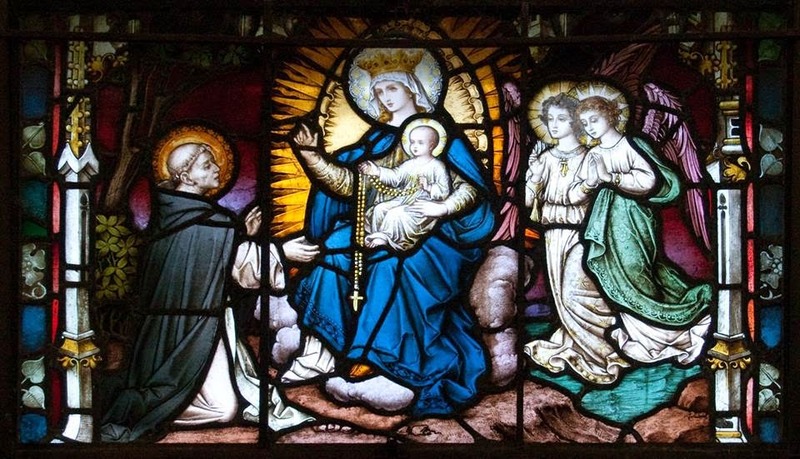 O glorious Mother of God, Queen of the most sacred Rosary, thou who didst love Dominic with the affection of a mother, and were most tenderly loved and honoured by him, look upon me, for his sake, with an eye of pity, deign to join with him in presenting these petitions to thy most Blessed Jesus. I sincerely desire from this moment to love Him with all my heart, and serve Him with all my strength, and now place myself under thy powerful protection, as a sure means of obtaining all the graces necessary to serve Him faithfully here, that I may eternally rejoice with Him hereafter. Amen.